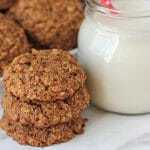 Bake up a batch of these vegan gluten free oatmeal cookies and enjoy a sweet taste of your childhood! These nostalgic and super easy vegan cookies are soft, chewy, and have a hint of cinnamon you’ll love. AND… you can have them ready to serve (and devour!) in under 30-minutes! When you think back to the treats you ate and loved when you were little, chances are, cookies are on that list, right? 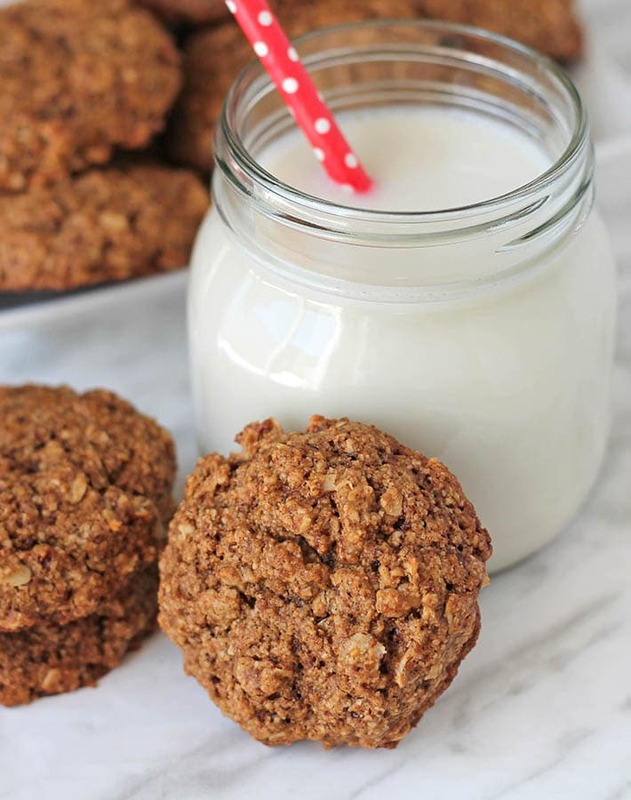 Oatmeal cookies, along with chocolate chip cookies are on my list (my very long list!) of favourite childhood treats. 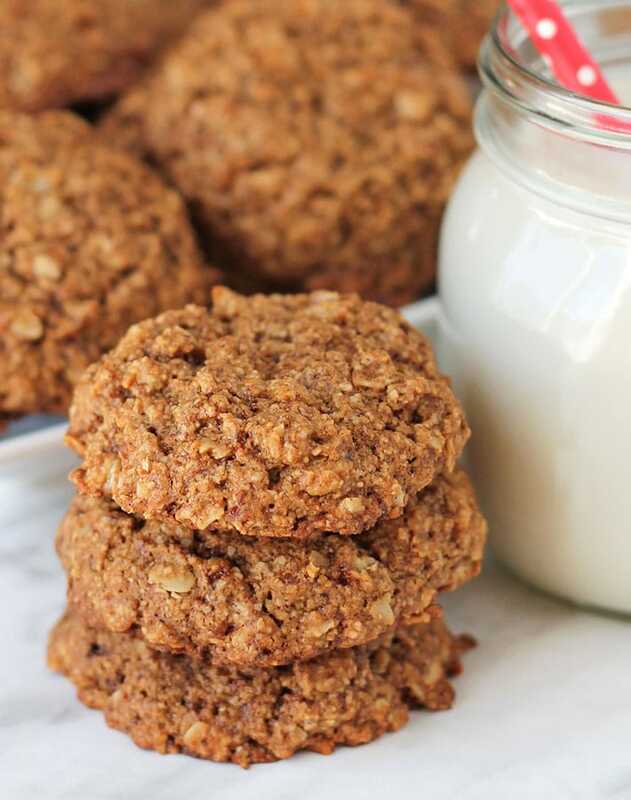 These simple oatmeal cookies will hopefully remind you of the warm cookies you had as a kid, except these are nut-free, egg-free, dairy-free, flourless, and gluten-free…and you wouldn’t even know it! 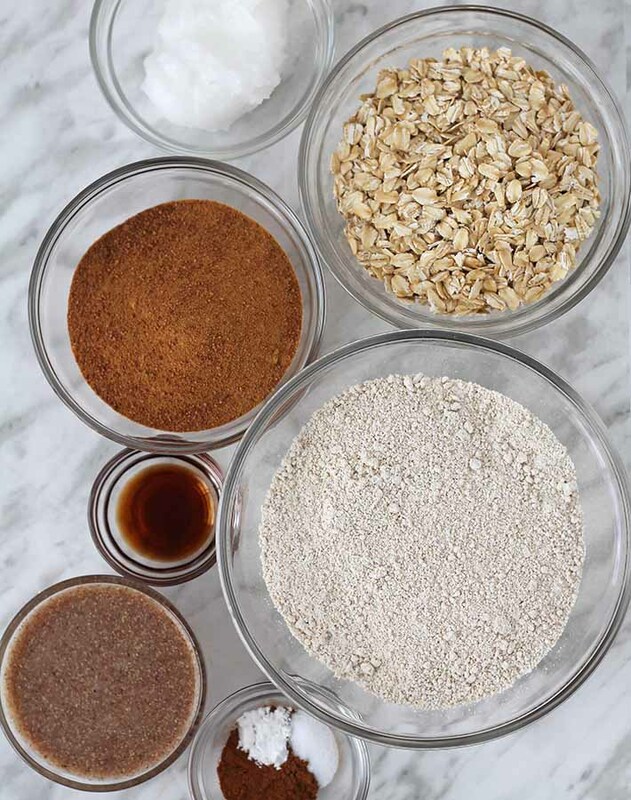 All you need for this recipe is nine simple ingredients that you probably already have in your cupboards (10 if you count the two ingredients that go into the flax egg!). Rather than using regular flour, you’ll need to use oat flour, which gives the cookies a great texture and heartiness (see below for my recommendation on the best type of oat flour to use). 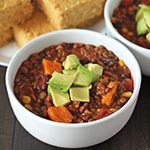 First, you’ll mix all the dry ingredients together, then, in a separate bowl, mix all of the wet ingredients. You’ll then add the dry ingredients to the wet ingredients and stir everything together. 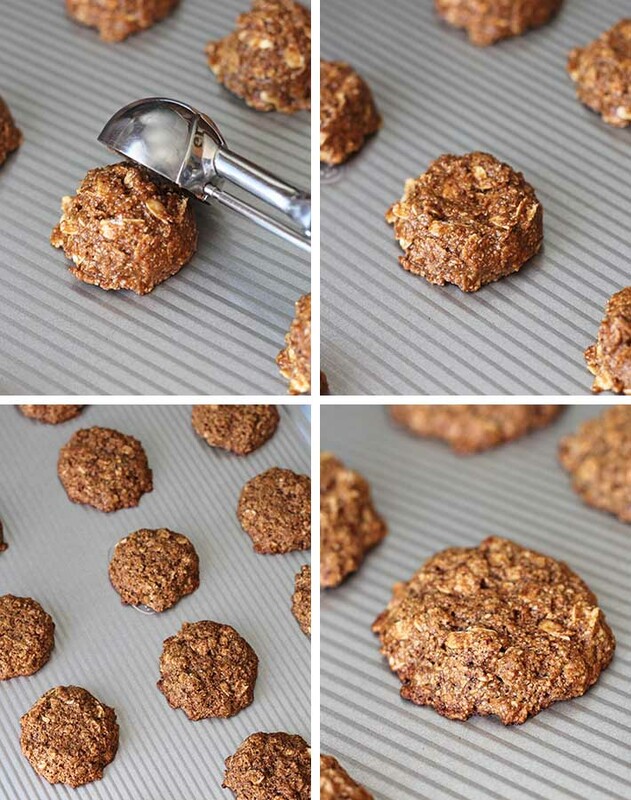 The next step is to scoop out your gluten free oat cookie dough, using a spoon or a medium cookie scoop (this is the one I own, love, and use A LOT! ), onto your cookie sheet. The cookies will spread a tiny bit while baking, but you need to give them a little help, so you’ll then press each cookie down to flatten slightly. Next, bake the cookies and once they come out of the oven, let them sit for a few minutes before moving them over to a cooling rack. Your gluten free cookies are now ready to enjoy! What’s better than a warm cookie fresh out of the oven?? I never buy oat flour, I always make my own because it’s cheaper. 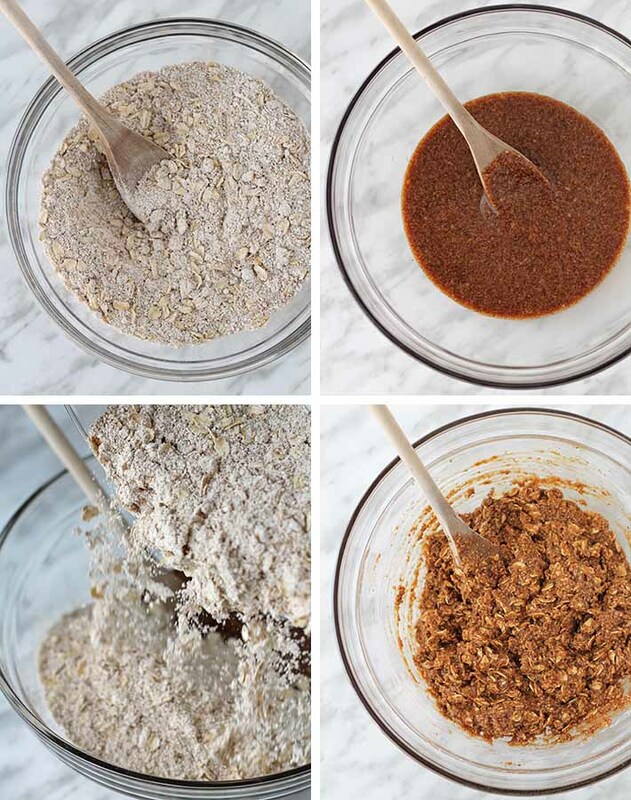 I outline how to make your own oat flour in this post. Give it a try, because once you do it and see how easy it is (and how much money you’ll save), you’ll never go back to buying it again! 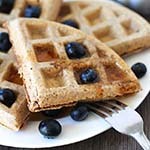 If you don’t want to make your own oat flour, which is perfectly fine, store-bought will work just as well for this recipe. If you prefer your oatmeal cookies with chocolate chips or raisins, I have separate recipes for those, too! 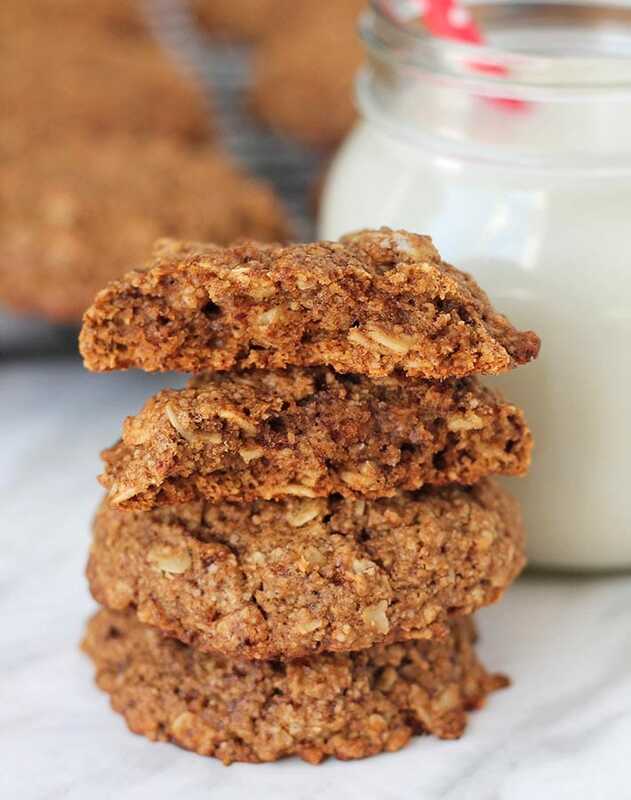 You can add those things into this recipe, but since each of my easy vegan oatmeal cookie recipes are slightly different, I encourage you to try the one that calls for your favourite add-ins, rather than altering this one. After they have cooled a bit, the outside edges will be a little crispy and the inside, super soft and chewy (see the picture below to get a peek at the inside). But after you store the leftovers in an airtight container, the crispy edges will become soft like the rest of the cookie. The only thing that changes after you store them is that the crispy edges will soften. These cookies are just as good on day one as they are on day three and beyond…I actually think they get even better with time! 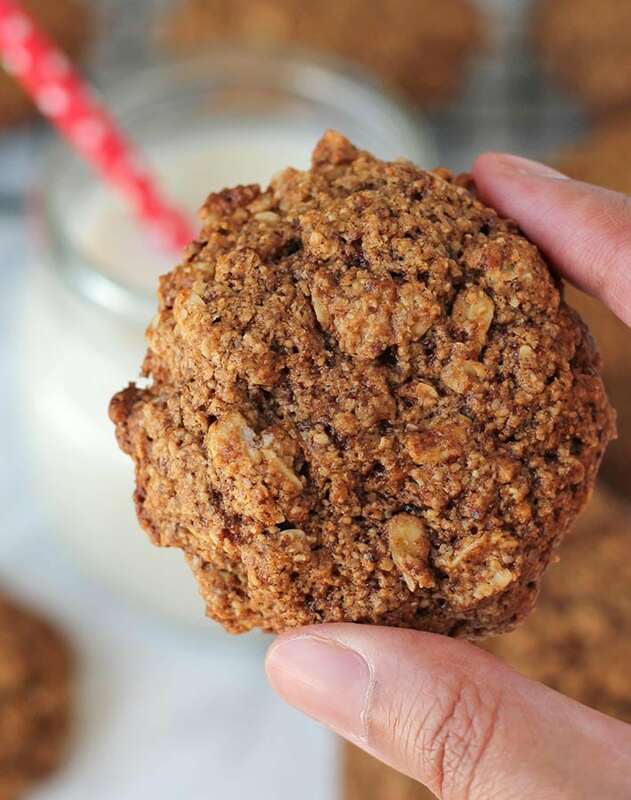 Share a pic with me on Instagram if you make these super simple vegan oatmeal cookies! I love seeing your remakes 🙂 I am @delightfuladventures on Instagram. You can also sign up for my newsletter so you can keep up to date on all of my new recipes. 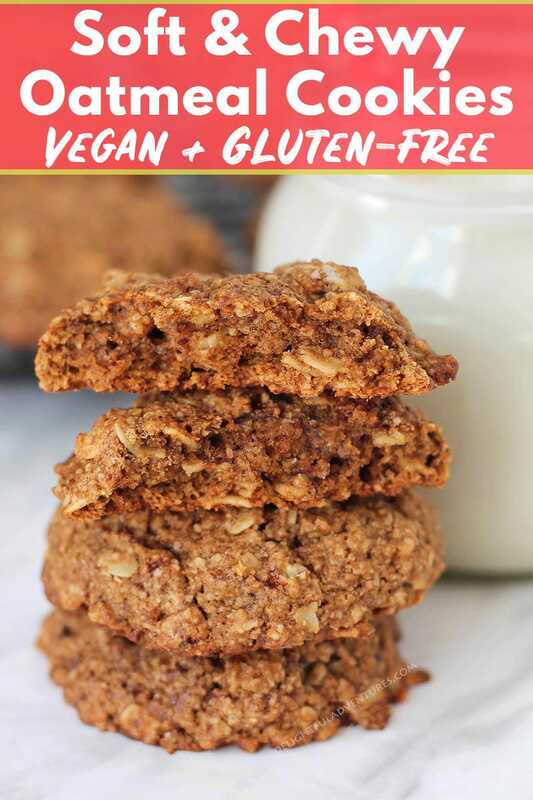 You can also help me to help others find these delicious gluten free vegan oatmeal cookies by pinning it to your recipe board on Pinterest! You can do that by clicking here. 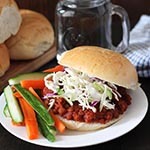 Please read all of the helpful tips and FAQ above before making this recipe.